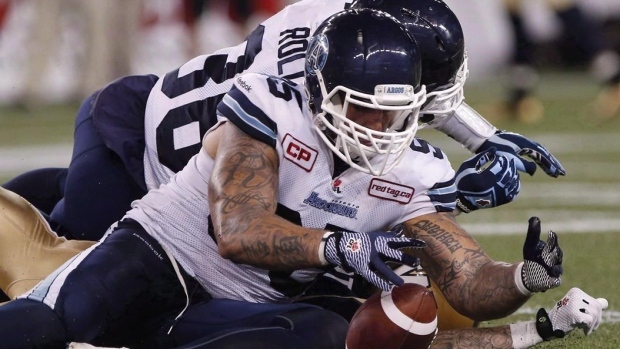 TORONTO — Ricky Foley was released by the Toronto Argonauts on Friday, with the veteran defensive end getting the news in a text message from a front-office official. "Released via text message by the assistant GM smh...Way to keep it classy #Argos," Foley tweeted. The move comes a day before Foley was reportedly due a roster bonus. A league source also said the Toronto club had asked Foley to restructure his contract. The Argos made the move official in a statement after Foley took to social media to release the news. The team confirmed that Foley was informed of his release in a text message. However, they added they tried multiple times to reach him via telephone Thursday evening but Foley never returned any of the messages. The Argos also said they reached Foley's agent, Johnathon Hardaway, via telephone Thursday night and informed him of their intention to release Foley. In February, veteran slotback Andre Durie tweeted he was no longer playing for Toronto after 10 seasons with the club. Durie declined to elaborate, but the move fuelled speculation of a falling out between the organization and one of its most popular players at a time when it was without a GM and head coach after Jim Barker was fired and Scott Milanovich resigned to become an assistant coach with the NFL's Jacksonville Jaguars. That left assistant GM Spencer Zimmerman in charge of football operations until Jim Popp was hired as GM on Feb. 28. "LMAO WOW #lame at least you got a thank you letter ??????? LOL . Keep ya head fam you got a lot of ball left," Durie tweeted in response to Foley's earlier message. The six-foot-two, 258-pound Foley was in his second stint with Toronto. The veteran defensive end joined the Argos in 2010 and remained through the 2012 season before spending the 2013 ad 2014 campaigns with the Saskatchewan Roughriders. Foley rejoined the Argos in 2015. The 34-year-old native of Courtice, Ont., played in 76 career regular-season games and five playoff contests with Toronto, registering 184 tackles, 20 sacks, two forced fumbles and an interception. He was named the top Canadian in Toronto's 35-22 win over Calgary in the 100th Grey Cup game at Rogers Centre in 2012. A three-time CFL champion, Foley was the league's top Canadian in 2009 while with the B.C. Lions. The Lions selected Foley in the first round, fourth overall, in the 2006 CFL draft out of York University.